K200 is a RFID Time and Attendance Systems, IN and OUT status, also low price with good performance, designed especially in the purpose of popularizing the fingerprint products. It could store 30,000 cards and 50,000 transaction records. Very neat design suitable for Tailoring units, factories, Mills etc. 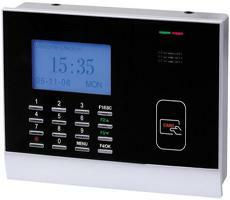 The device can be assigned local IP Address and connected in local network for Time Attendance Software Integration. The reports can be exported in Excel or Pdf format.